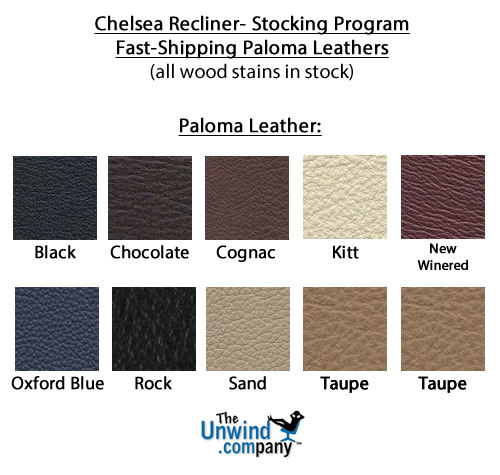 Available in select fabric, Batick and Paloma leathers- Please call or chat. Now is a great time to save big on the world's most comfortable recliners. Choose from a few select Batick, Paloma and fabric models. Exceptional savings await! Also take a look at these great add-on accessories: The simple Swing Table, the ultra-convenient Personal/Laptop Table, the useful Ellipse Table, the stylish Urban Table, or the fan-favorite Elevator Ring set. Enjoy Fast, Worry-free Delivery on a Small Stressless Mayfair Recliner with Ottoman. Start relaxing in your beautiful new Small Mayfair (Chelsea) Recliner sooner with our Quick and Easy Shipping Methods. It's a great time of year to purchase from the amazingly comfortable, Stressless Mayfair line! This popular, modern recliner delivers exquisite head, neck and back support and the over-stuffed smooth, soft, cushioning allows you to sit undeterred for many hours on end. The Stressless Mayfair small recliner is among the most modern Stressless recliners available. Choose your preferred leather type and color by selecting from the small color swatches. Then choose from the beautiful wood stains. Typically, we keep all stains in stock. Looking to add a matching Stressless Sofa, Loveseat or Sectional? You’re in luck as the Ekornes Batick & Paloma Specials Sale Colors are also eligible for additional savings under this promotion. You receive Paloma Special Pricing Colors at Batick Special Pricing levels and Batick Special Pricing Colors at $100 off their regular pricing. These deals can save you $1000’s. Simply choose your matching Batick or Paloma leather sofa or sectional model and watch the savings stack up! Want to add a matching Stressless Sofa or Love Seat? The Windsor Sofa Series and the Ekornes Buckingham Models match perfectly. The Windsor features Medium-Sized Seats and the Buckingham boasts slightly taller and wider large sized seats. There are also Batick and Paloma Specials for the Buckingham that save you $1000’s simply by selecting 1 of the 4 special colors in Batick or Paloma leather grades. Our Nationwide White Glove Delivery means that we will bring your recliner, office chair, sofa or sectional into your home (or office), unpack it, set it up and take the box/packaging with us when we leave. Of course your furniture will arrive fully-assembled and ready to enjoy! *Would you prefer to receive your Chelsea recliner faster? Choose one of our other speedy delivery methods. The Popular Stressless Chelsea Recliner & matching Ottoman (small size Stressless recliner). Learn about White Glove Delivery at Unwind.com. Like its larger brothers (the Stressless Mayfair recliner and the Stressless Kensington recliner), the Stressless Chelsea recliner has been called "perfectly comfortable in all the right places." We translate this to mean- "Just the right amount of support and comfort to the parts of the body that desperately seek a refuge from the toils of everyday life." 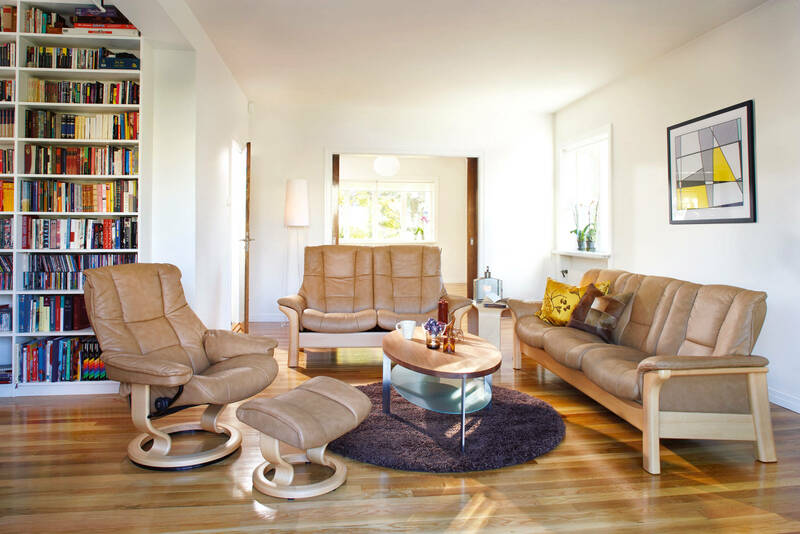 Want to view informative Ekornes Stressless videos to assist you in selecting the perfect Stressless Recliner? Simply click the following link, select the search button (the magnifying glass on our YouTube page) and type the name of the Ekornes chair or Stressless furniture item that you would like to preview. You can also search by leather type & color to get a closeup view of most popular leather options. 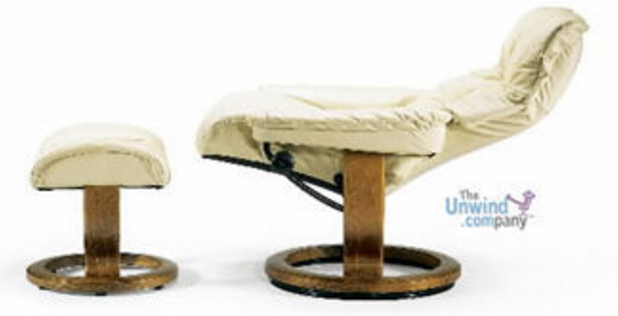 Search and watch 100's of Stressless recliner videos at The Unwind Company YouTube site here. Are you interested in financing your purchase? We have great news. We currently offer financing opportunities to perfectly suit your needs. Choose a financing option that will suit your budget and help get you the comfort you need. PayPal Credit is our best financing option at this time. They are customer oriented and can help you get this ultra-comfortable chair in your home today. No need to wait any longer. - Stressless recliners relax your entire body by providing perfect balance and optimum support. - With the Stressless Glide System, you can automatically shift to any seating position by simply using your body weight. - The independent, easily-moved ottoman also features a tilt-system that adjusts to your body movements for the ultimate in comfort. - Stressless recliners and accessories are built to last for many, many years- and they do. -Stressless Recliners are created for a custom fit- Many of the Stressless recliners come in three sizes (small, medium or large) and many sofas are available in two sizes (medium or large). The Stressless Chelsea Recliner (small) is comparable to the small versions of the other Stressless recliner lines (Stressless Oxford Small, Stressless Atlantic, Stressless Vision etc). The Stressless Chelsea, Stressless Mayfair and Stressless Kensington Recliners (small, medium and large) share the same attributes. For best results, take a seat and let us help you determine which size will ultimately offer the most comfort and correct support for your individual body size and weight. It's no surprise that Stressless Chelsea Recliners are Exclusively Endorsed by the American Chiropractic Association (the ACA). Come visit the Unwind Back & Body Store to experience the Ekornes Stressless Chelsea for yourself. If you have already decided and are ready to purchase, simply click the "Add To Cart" button after selecting from the available options below. We will ship your Chelsea recliner fully-assembled and ready to enjoy. Please review our return policy prior to ordering or call 888-486-9463 (or 1-601-932-5111) for personal assistance. You may also email stressless@unwind.com anytime- 24 hours a day- 7 days a week. 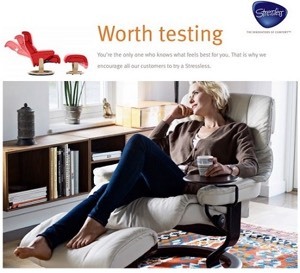 Excellent 10 Year Warranty from Ekornes.